If you’re looking for an all-foam bed that’s a fit for your body and budget, the Tuft & Needle mattress could be calling your name. This bedding brand set out to create a basic yet comfortable mattress: no frills, fancy foams, or unfair prices included. The mattress is designed to provide optimal support, cooling comfort, and pressure relief for all types of sleepers. With the price starting at a mere $350, I tested this bed-in-a-box to find out if the quality is as good as the affordability. I also wanted to uncover what types of sleepers — back, stomach, side, or combo snoozers — would enjoy this bed. Keep reading for my entire, in-depth review! If you’re short on time, head on over to my handy summary. 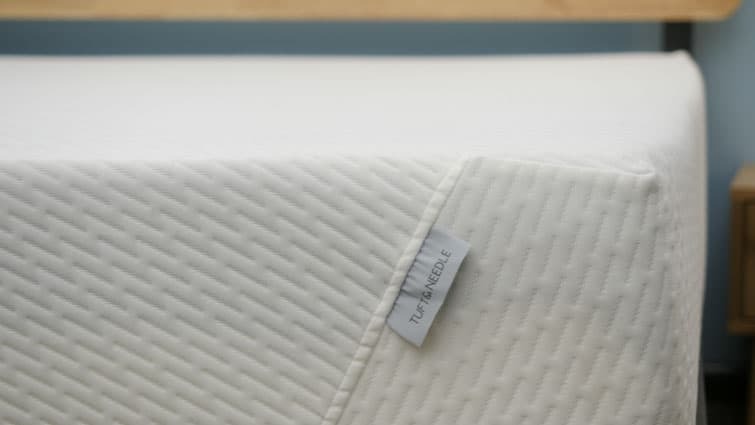 Tuft & Needle was founded in 2012 by two software engineers from Silicon Valley who were frustrated with the lack of transparency and fairness in the mattress industry. Today, the company continues to make its mark by pricing mattresses significantly lower than almost all of the popular online mattress brands. The company began with a single mattress — the one I’m reviewing right now — that is designed to serve all types of sleepers. To build a comprehensive bed, the founders used their tech backgrounds to run various tests and prototypes. After numerous iterations, which included developing proprietary foam, the team launched its first mattress. Now, Tuft & Needles offers an additional model, the Mint Mattress, which includes an extra layer of adaptive foam for pressure relief. I’ll compare these two side-by-side later on in this review. 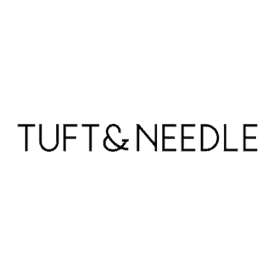 You can also purchase various bedding and furniture products from Tuft & Needle to round out your bedroom experience. Oh, and if you’re wondering where the name came from, look no further: When brainstorming names for the company, both founders wanted something that sounded authentic, timeless, and modern. One of them fondly remembered the tufting needle he used while making his first mattress. It stuck. What is the Tuft & Needle Mattress Made Of? As I briefly mentioned above, one of Tuft & Needle’s x-factors is its proprietary foam. The Adaptive® foam is made to feel comfy and provide great pressure relief without “feeling too soft or like quicksand.” Beneath the comfort layer is a thick, supportive base. Considering this is a straightforward construction that includes just two foam layers, most of the magic happens in the comfort layer. Cover – The top of the Tuft & Needle is a polyester cover. Because it’s pretty thin, air should flow easily through this mattress to help with temperature regulation. Polyester is known for being soft but mighty, retaining its shape and durability even through lots of wear and tear. 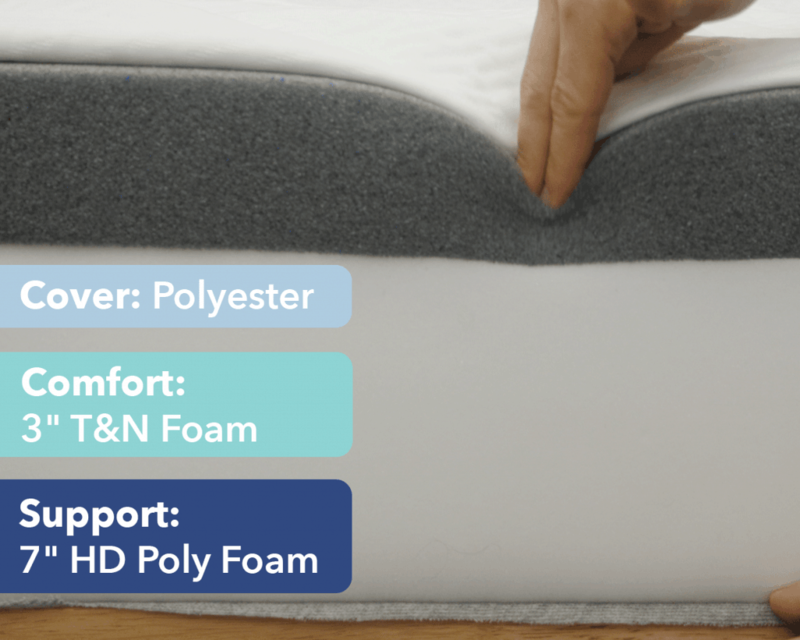 Comfort – The comfort layer on the mattress is made of three inches of Tuft & Needle’s proprietary poly foam. This layer has a quick response to pressure, which should provide good mobility and a lot of bounce to ensure you won’t feel too stuck in bed. There’s also a bit of cooling gel inside the comfort layer to help prevent heat from getting trapped in the foam. Support – Immediately below the comfort layer is the base layer, consisting of 7 inches of high-density poly foam. This section is meant to give the mattress its sturdy shape and to help keep the sleeper positioned on top of the structure. However, since this mattress only has two layers, heavier folks might be susceptible to sinking through the comfort layer and bumping into the super firm base. How Firm is the Tuft & Needle Mattress? Fun fact: I’ve previously tested the Tuft & Needle mattress. I am back for more after the team made a few adjustments to the design. Much to my surprise, when I press my hand into the Tuft & Needle, I notice this mattress feels a lot more firm than what I remember. The indent of my hand also retracts almost immediately. This means the polyfoam has a quick response to pressure, which leads me to believe that I will be able to move around pretty easily while lying on the mattress. Before I jump in bed and see how this firmness feels across my entire body, I want to explain how I determine how firm a mattress really is. Since I have a specific body shape and sleep preference, I don’t want to rely on my opinion alone. Therefore, three of my coworkers tested this bed out, too. We each rolled around on the Tuft & Needle and provided a firmness level score between 1 and 10: 10 being the most firm and 1 being the softest. Then we averaged our scores together to come up with the final number which you can see on the graphic below. The verdict? We came up with an average score of 7.5, which means this bed is pretty darn firm. When I tested the older version of this bed, the firmness score was closer to 6.5, meaning this bed has become more firm since it was updated. Since the Tuft & Needle is on the firmer side, I immediately think it will be a better option for back or stomach sleepers who need firm support at the spine while avoiding any hip sinkage. I’d also say this bed could be a real win for combo sleepers, thanks to the excellent mobility and bounce you’re likely to experience in the top layer of proprietary foam. Another important component to examine on any mattress is how well it will relieve pressure — specifically around the hips, shoulders, lower back, and spine. Luckily, I have a handy pressure map that does this detective work for me. Back – Lying on my back, my weight was evenly distributed across the surface of the mattress. While the graph is indeed blue, I did feel my back sink slightly into the foam, a quality even the firmest of foams sometimes gives off. That said, I still felt like my spine was safely aligned and my hips well supported. Back sleepers will most likely not feel tension on this bed. Side – Turning onto my side, I was curious what this firm foam would uncover on the graphic. Unsurprisingly, I did feel a bit pressure and green appeared on the screen, but not as much as I would have expected. Because this foam is bouncy with a high response to pressure, I could roll around easily. Side combo sleepers might be able to get away with some side-sleeping on this bed. 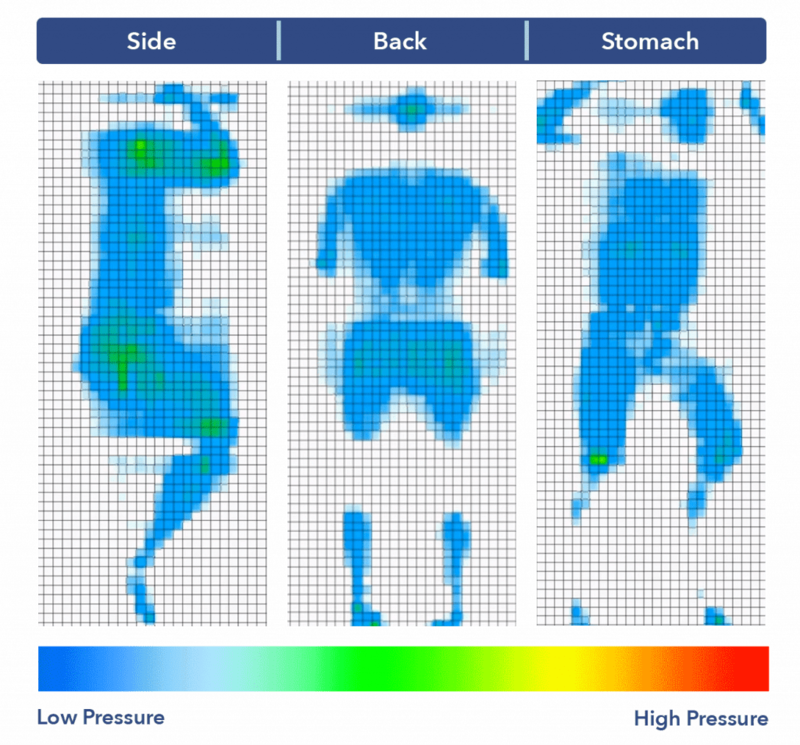 Stomach – As expected, there is blue across the board as I lay on my stomach, indicating low pressure across my body. In addition to strong support for the hips, it’s also important to have low pressure on your chest in to ensure you can breathe easily. The Tuft & Needle shows top-notch results in this area. Now that we have a better idea of what the Tuft & Needle mattress feels like, I was curious to compare the bed to two of its top competitors: Casper and Purple. While they all compete with one another, I found distinct characteristics across each mattress, with very few similarities. 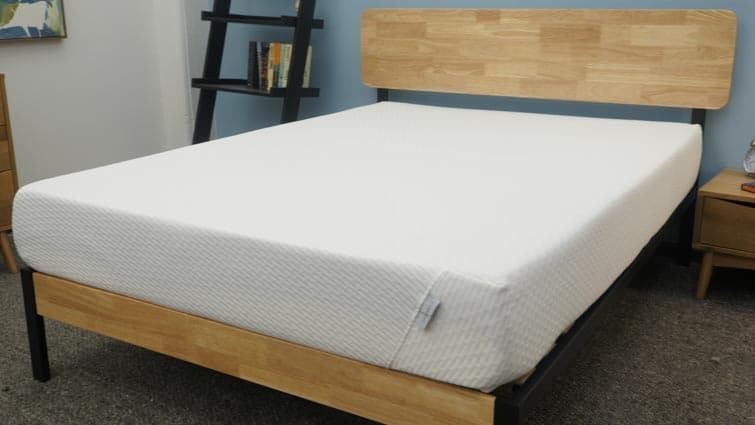 The Casper is also an all-foam bed, featuring a layer of latex foam over memory foam to provide a combination of bounce, mobility, and contoured support. Additionally, the comfort layer on the Casper includes Zoned Support to provide extra, targeted support for the shoulders and hips. As far as sleep position goes, combo sleepers will likely enjoy the Casper since it’s slightly less firm than the Tuft & Needle. In terms of price, the Casper is a lot more expensive, with a Queen bed priced at $1,000 as compared to the Tuft & Needle’s price of $595. For more on the Casper, check out my full Casper review. Unlike Tuft & Needle, the Purple mattress features a proprietary hyper-elastic polymer smart comfort grid that gives off a super bouncy feel. 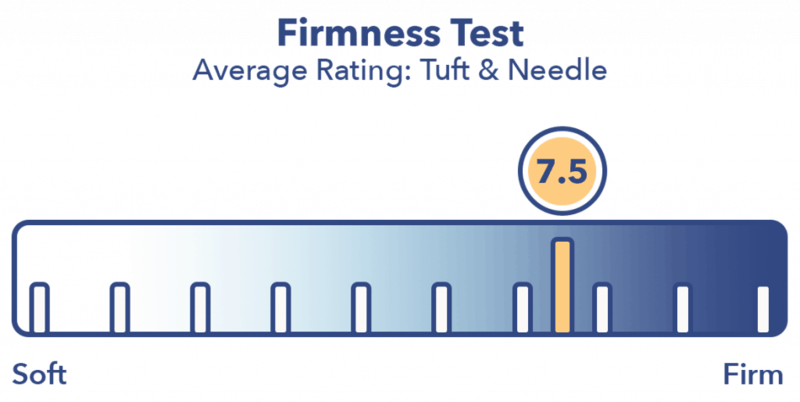 Additionally, the Purple mattress is a bit softer than Tuft & Needle, hovering somewhere between a 6 and 6.5 on the firmness scale (with 6.5 being the industry standard for medium firmness). Just like Casper, the Purple bed is $1,000 for a Queen, making this bed pricier than the Tuft & Needle. Read my entire Purple mattress review for all the info! As I mentioned at the beginning of this article, Tuft and Needle sells another all-foam mattress: The Mint. Let’s place them side-by-side. The Mint features an extra layer of adaptive foam in its construction for pressure relief. There’s also a thick, knit cover for added durability and coziness. It also includes reinforced edge support, which makes the surface area of the bed feel bigger and is great for couples who might roll to the edges of the mattress. Want to learn more? Head on over to my Tuft & Needle Mint mattress review. Next up, we’ll be testing motion transfer, which will demonstrate the amount of movement you’ll likely detect from one side of the bed to the other. If you have a partner who loves to toss and turn at night, you’ll want to read this section. These results are pretty average when compared to other motion transfer tests I’ve run. Overall, the motion transfer won’t be terrible, but because this a firmer bed with lots of bounce, you might feel some disturbance if your partner tends to get rowdy in their dreamy, REM sleep. How Far Will You Sink Into the Tuft & Needle? Lastly, let’s chat sinkage. This test shows how much you’re likely to sink into the bed, an important way to decipher if you’ll feel more “inside” the mattress or “on top” of it. The variations in size, weight, and density are meant to simulate different body parts and different sized sleepers. As I expected, the test showed less sinkage than what I typically see from other foam mattresses. Given its firm feel and quick response to pressure, you’ll most likely feel more on top of the Tuft & Needle than stuck inside it. 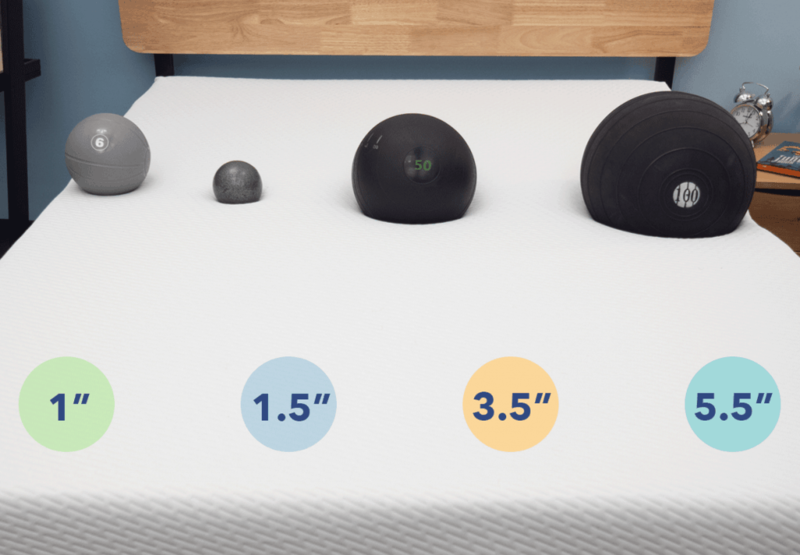 This generally means you’ll have great mobility on this bed, but won’t get the same pressure-relieving support you might get from other all-foam beds on the market. 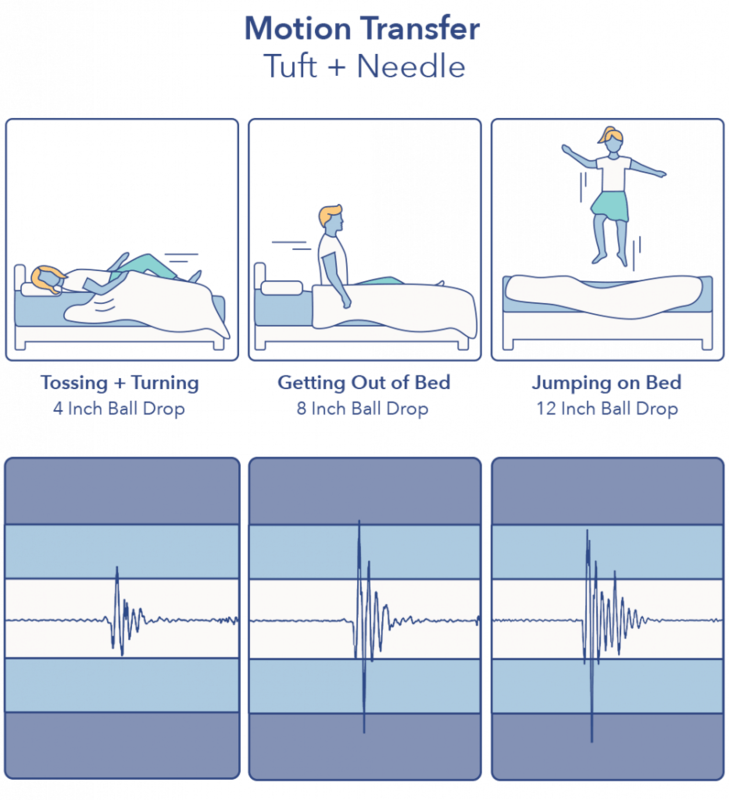 Is the Tuft & Needle Mattress Right for You? Unfortunately, I can’t make any personal recommendations or provide definitive yes’s or no’s, but I can leave you with some final pros and cons to help you come to your decision. With a Queen priced just under $600 and quality foam to boot, you can’t beat the value of a Tuft & Needle mattress. The firm feel will be best for back and stomach sleepers who need strong hip alignment and spine support. I think this bed does a great job at cooling, so if you need a breathable bed that doesn’t trap heat, look no further than this one right here. Side sleepers may find the bed too firm as they’ll typically want a softer mattress for better shoulder and hip support. This mattress might not be a fit for heavier folks who might push through the comfort layer and bump up against the extra-firm base. I was wondering if tuft and needle offers a mattress topper? And if you are at all concerned with materials as in polyurethane that is almost always used in memory foam? I wonder if latex is better for the health? I am also curious as to what the difference in feel when you lie down on the latex as compared to memory foam? I understand the response is different but is it just as comfortable? I am consering the Tuft and Needle Original or Mint. I have to use a walker to get out of bed. So need good supporst to stand a then reach for the walker. I am 160 lbs and 5foot 5and 1/2. I would appreciate some advice. Would the Tuft & Needle mattress work well on an adjustable bed? I appreciate the thorough reviews! Which would you say is the more firm mattress: the original T&N or the Nest Love & Sleep firm? I am a little smaller than you, mostly sleep on my back with some side sleeping. Thanks! I appreciate the thorough reviews! Which would you say is more firm: the original T&N or the Nest Love & Sleep firm? I’m just a little smaller than you, mostly sleep on my back with some side sleeping as well. Thanks! Tuft and Needle – Original vs. Mint? Your thoughts as to which mattress to purchase would be appreciated. I would probably say the Mint for your wife and the Original for you in that situation. If it just a king I would say go with the Original.